A healing green landscape has blossomed in the place of a former concrete plaza in Los Angeles. 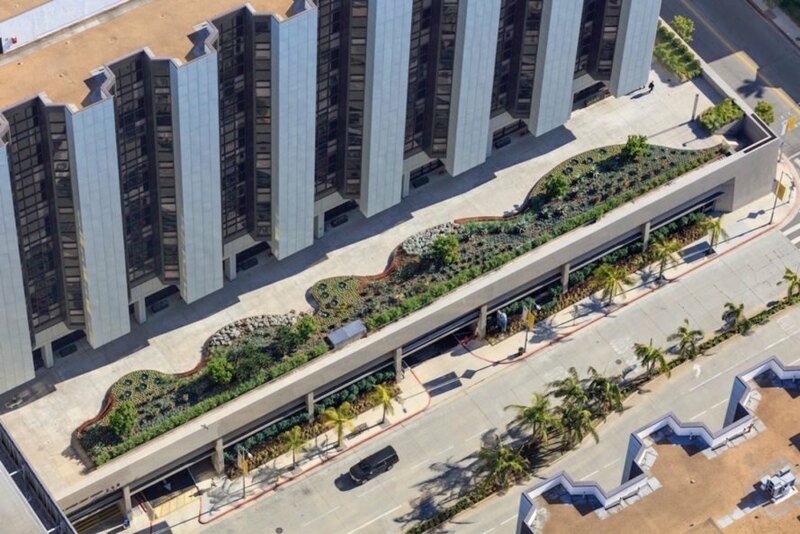 Local firm AHBE Landscape Architects transformed a concrete site atop a multi-level garage into the new Healing Gardens for Cedars-Sinai Medical Center. The unique, green roof-inspired system features four distinct gardens that promote healing, health, and well-being for patients, hospital staff, and visitors. 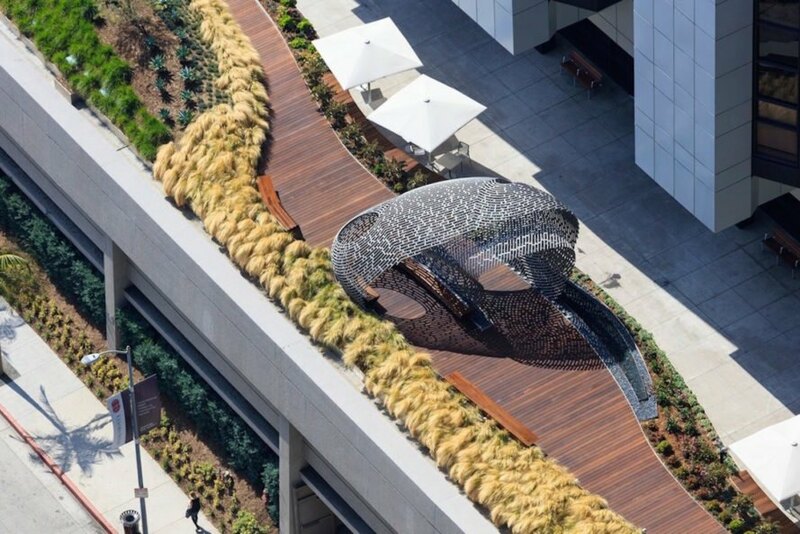 Since the site was located atop a building, AHBE had to develop a multi-layered landscape solution that would protect the existing building’s structural and mechanical integrity while accommodating four lushly planted gardens. 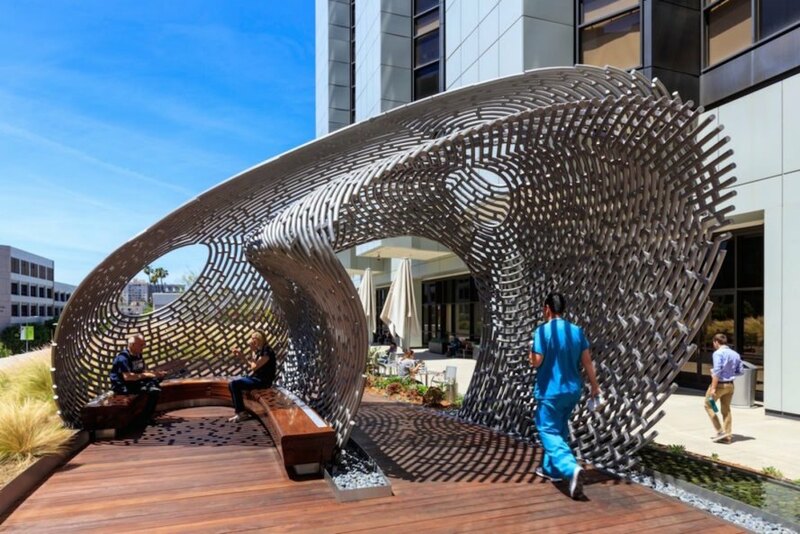 “The Cedars-Sinai Healing Garden Plaza project presented several constraints that encouraged innovative thinking,” said Calvin Abe, FASLA, RLA, who led the project team. “The terraces had previously been unused for many years. 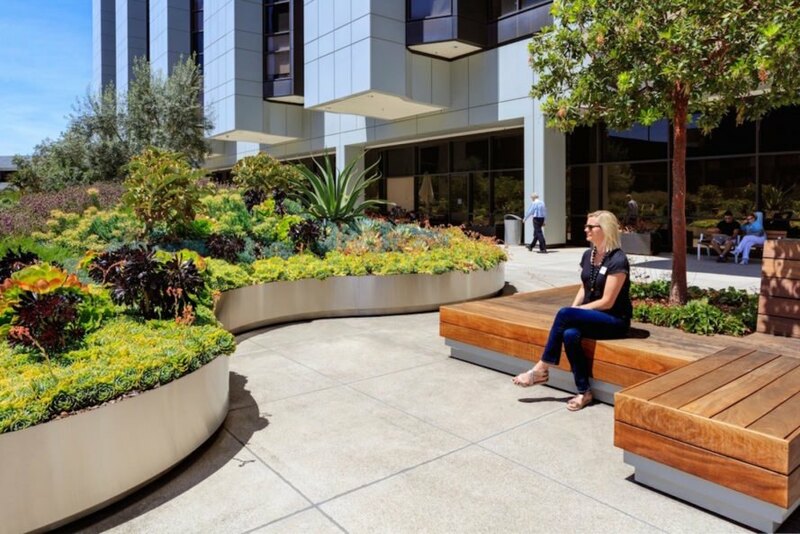 We aimed to heal the epidermis of the complex by grafting a piece of living, breathing landscape above the existing parking decks.” The addition of the Healing Gardens is an extension of Cedars-Sinai Medical Center’s mission to prioritize quality patient care. The Healing Gardens comprise four distinct gardens with carefully crafted planting palettes. The Garden of Whimsy “lift[s] and energize[s] the human spirit” with undulating planters and a sculptural pavilion by Ball Nogues Studio as the focal point. In contrast to the more active Garden of Whimsy, the shaded Blue Garden is designed for quiet meditation and features private nooks and small circular reflecting pools. The open Plaza Garden accommodates a variety of events with moveable and convertible furniture; the space is complemented with textural plants such as agaves and succulents. The Education Garden features “adaptive natives” from non-U.S. Mediterranean climates and includes space for outdoor lectures, health fairs, and informal meetings. A healing green landscape has blossomed in the place of a former concrete plaza in Los Angeles. 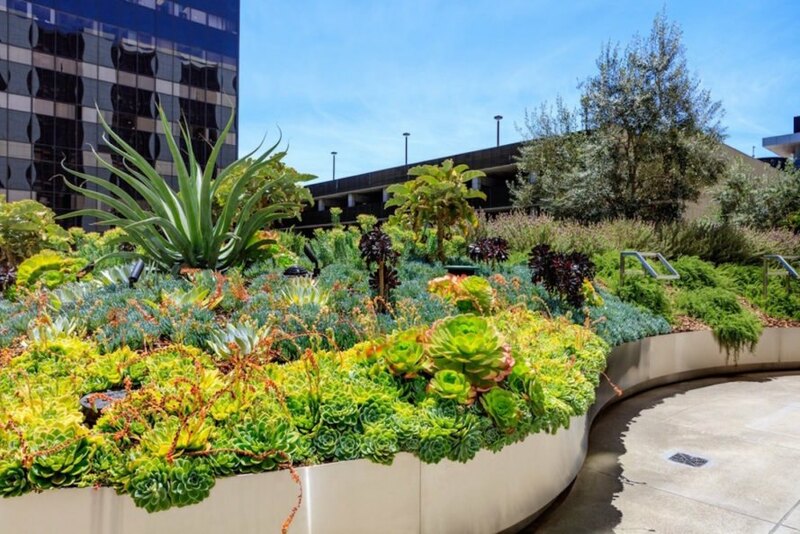 Local firm AHBE Landscape Architects transformed a concrete site atop a multi-level garage into the new Healing Gardens for Cedars-Sinai Medical Center. The unique, green roof-inspired system features four distinct gardens that promote healing, health, and well being for patients, hospital staff, and visitors. 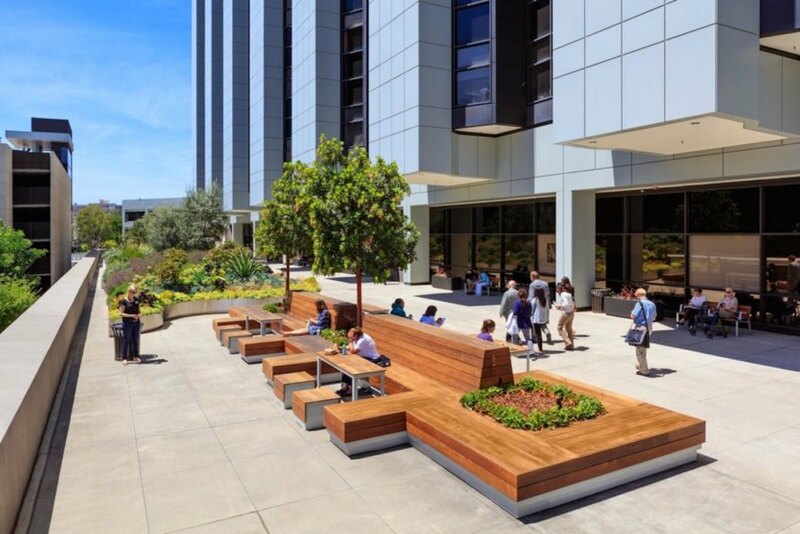 Since the site was located atop a building, AHBE had to develop a multi-layered landscape solution that would protect the existing building’s structural and mechanical integrity while accommodating four lushly planted gardens. 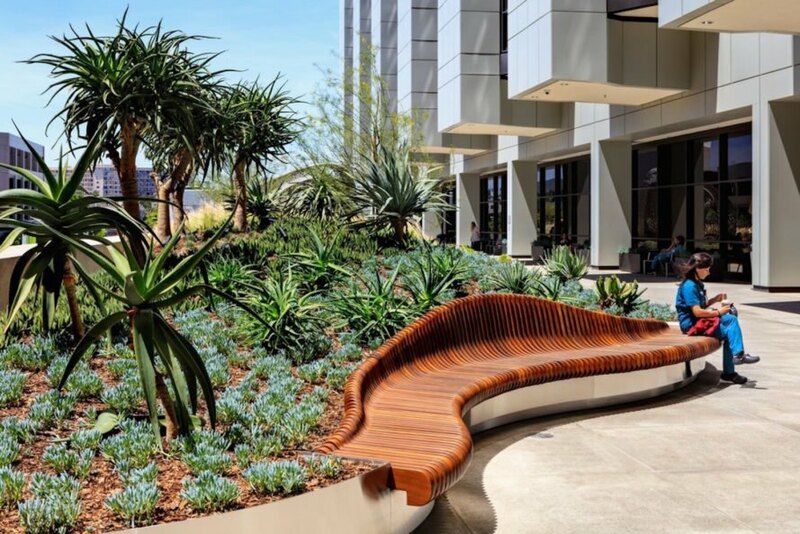 The addition of the Healing Gardens is an extension of Cedars-Sinai Medical Center’s mission to prioritize quality patient care. The Healing Gardens comprise four distinct gardens with carefully crafted planting palettes. 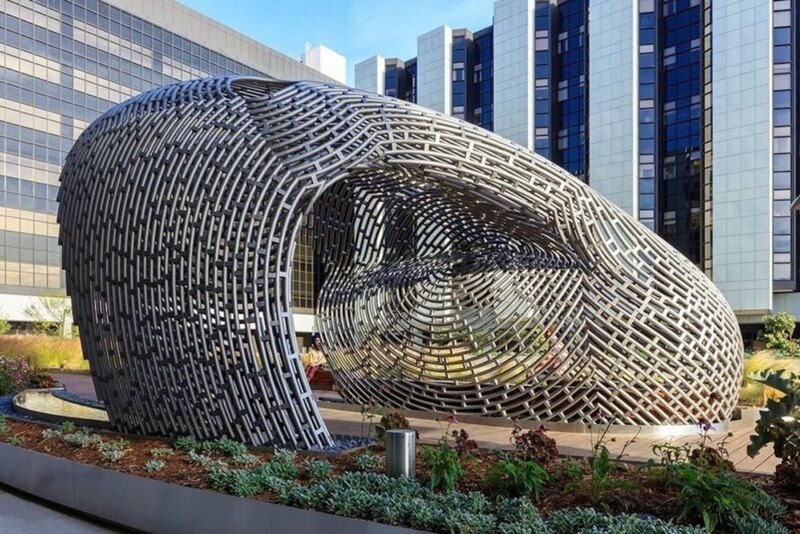 The Garden of Whimsy “lift[s] and energize[s] the human spirit” with undulating planters and a sculptural pavilion by Ball Nogues Studio as the focal point. In contrast to the more active Garden of Whimsy, the shaded Blue Garden is designed for quiet meditation and features private nooks and small circular reflecting pools. The open Plaza Garden accommodates a variety of events with moveable and convertible furniture; the space is complemented with textural plants such as agaves and succulents. The Education Garden features “adaptive natives” from non-U.S. Mediterranean climates and includes space for outdoor lectures, health fairs, and informal meetings.